We usually manage a tea or coffee break, with biscuits, during the day, but it is important that you bring a bottle of water or other drink with you. 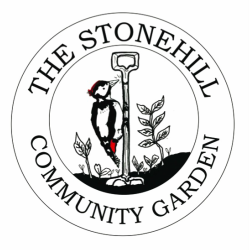 If you or your group would like to use Stonehill for gardening or related activities, please get in touch. We would love to welcome you on a Wednesday, or alternative days by prior arrangement. See our contact page for more details. Here are the activities and projects we have planned for weekly sessions in April. Dig footings for water tanks and lay foundations, as part of our irrigation project. Plant out in trays in nursery poly tunnel: sweetcorn, runner beans, courgette, pumpkin, broccoli, spring onions, lettuce, parsnips. These will be planted into the plot once they are large enough and the weather is optimal. Start renovation of second pew, a donation from St Peter's Church, Drayton. Build support bases for large water tanks, which will store the water for our irrigation system. Make up more potting compost. Set up base pump and tap for irrigation system. Plant wild flower and herb seed in trays in poly tunnel. Build bug hotels and hedgehog homes. Install large water tanks for irrigation system. Install irrigation pumps and taps for reservoir tanks, poly tunnels and plot. Set up fully functioning solar panel for compost lavatory. Build unit for sink in composting lavatory. In March, we have plenty of activities to get involved in every Wednesday. Start renovation of second pew (kindly donated by St Peter's Church, Drayton). Continue setting up our irrigation system - installing the water pump and tap. Service the wind turbine, so that we can generate renewable energy. Build benches ready for our plant nursery poly tunnel. Order early potatoes for planting this month. Continue setting up the irrigation system - digging footings for water tanks. Sow seeds in trays in nursery poly tunnel: sweetcorn, runner beans, courgette, pumpkin, broccoli, spring onions, lettuce, parsnips. Tidy up and clear out composting lavatory - ready for installation of a hot water system. Set up solar panel for compost lavatory, which will provide us with hot water for washing hands. Sow wild flower and herb seeds in trays in poly tunnel.